A feast for the eyes as well as a wonderful assortment of recipes. A breakfast bread and a cake recipe produced wonderful results. 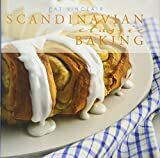 The rest of the book includes many tempting recipes - rye bread, lefse, Swedish pancakes, and rhubarb tarts all caught my eye. This unusual recipe collection would be a welcome addition to my collection.